Economic growth is the increase in the level of potential output in the economy over a period of time and it can be shown by a rightward shift in the production possibility frontier (PPF) (Graph 1) and this will also shift the long run aggregate supply (LRAS) curve to the right (Mankiw and Taylor, 2011). Economic growth can also be measured by the change in the gross domestic product (GDP) and the change in the real national income which is the income that adjusted for inflation (Matthews, Powell and Parkin, 2012). The fluctuations in the economy are known as the business cycle which resulting the change in economic growth. The business cycle has four main phases, boom, recession, slump and recovery (Graph 2). In a boom, aggregate demand increase so firms will increase output and this will cause economic growth. There are three types of growth in the economy, including actual growth, potential growth and trend growth. Actual growth is the changing of GDP over a period of time and it is affected by the change in the aggregate demand and the efficiency of the resources in the economy, potential growth is the rise in the quantity and quality of the resources in the economy and it is possible to happen without actual growth taking place, and finally, trend growth is the expected increase in potential output over time and it is a measure of how fast an economy can grow without considering inflation (Grant and Vidler, 2000). This essay will highlight the main causes, advantages and disadvantages of economic growth and consider various alternative measurements of economic growth which associated with the standard of living. Economic growth happened because of a few factors, one of them is the technological progress. The increase in the productivity of technology can increase potential output by using the same amount of capital and employment (Sheffrin and Sullivan, 2006). When the economy has enough supply, consumers are able to spend more. Technological progress will also increase the productive efficiency as the cost of production is reduced. A scientific calculator was not able to be produced a century ago, but 50 years ago, it could be produced with only very expensive machines, and today the calculator is available for only a few pounds (Anderton, 2008). The developed technology can produce new and better quality of goods and this will increase the firm’s profit as consumers are attracted to purchase those products. Hence, with those extra spending, there would be an economic growth. Economic growth is also caused by capital investments. A significant amount of fixed capital investments in factories, machinery and equipment is important for an economy to develop (Manser, 1994). When a firm decides to invest in new machinery, it means that the potential output level will increase and the labour cost will decrease so the firm’s profit will rise. If the successful investment in the economy increases, the productive capacity will also increase and this will then shift the PPF and LRAS curve to the right. In 2009 and 2010, the United Kingdom spent over 15% of its annual GDP on fixed capital (Gross Fixed Capital Formation, 2014). From 1960 to 1991, Japan, South Korea and Singapore had the highest economic growth because the rates of investments in those countries were high at that time (Hall, 2014). The other factor of economic growth is the quantity and quality of labour in the economy. The greater the amount of labour in the economy the more it will stimulate economic growth because the more workers, the higher the potential output level a firm can achieve (Sutcliffe and Sloman, 2001). Besides quantity, labour skills and abilities are also very important to economic growth (Parkin, 2010). The machines in the factory often require people to operate them, so it is important for the workers to have those skills. Workers who are well-trained and educated are more likely to contribute ideas to improve the current way of production and the technology. This will then lead to better uses of scarce resources, increase the potential output level and the long term trend rate of growth. The cause of economic growth is people’s confidences and expectations on the economy. Firms will increase investments if they feel confident and expect the rate of return on the investment to rise in the future (Begg, Fischer and Dornbusch, 2003). When planned investments rise, the economy will grow because of the addition to the capital stock in the economy which used to produce more goods and services. If consumers are confident about the future, they might increase consumption and create extra spending in the economy. Expectations of large increases in income will also encourage people to spend more and this will cause the economic boom (Soskice and Carlin, 2006). The next cause of economic growth is the presence of natural resources. Resources are important to a country because the country which has a lot of natural resources is able to produce goods and services which are low in costs and prices compared to those countries which need to import the resources (Samuelson and Nordhaus, 2001). When the costs are low, firms are able to increase output and export the goods to other countries and this can create surplus in country’s current account. The advantage of economic growth is that people’s standard of living will increase. Economic growth can reduce poverty because it can increase people’s income and this allows them to get essential goods for living (Samuelson and Nordhaus, 2001). If people have high income, they can consume more luxury goods and stimulate aggregate demand. This encourages firms to produce more and this will then increase the potential output level in the economy. When the income and output rises, the tax revenue will also rise without increases in tax rates (Parkin, M, 1997). The government then can spend more money to improve the public services, such as education and health care and this will then improve the standard living of people. The other advantage of economic growth is that employment rates will rises. When there is economic growth, aggregate demand will rise so firms will employ more workers to increase the level of production and this will create more job opportunity (Blanchard, 2000). Firms will feel more confident to increase investment during economic growth because of the high rate of return. When investments increase, job opportunity will also increase. The Quorn Food Company had created around 400 jobs because of the £30m of investment (BBC, 2014). If the employment rate rises, the government`s expenditure on paying people’s welfare for being unemployed will then decrease. In 1990s, the rate of employment for unmarried mothers rise by around 50% and this caused the amount of welfare paid to decrease by nearly 56% (Kim and Rector, 2006). Hence, the government can spend a large amount of money to enhance the quality of the public services. Next, the major disadvantage of economic growth is the inflation effect. Economic growth will cause aggregate demand to increase. 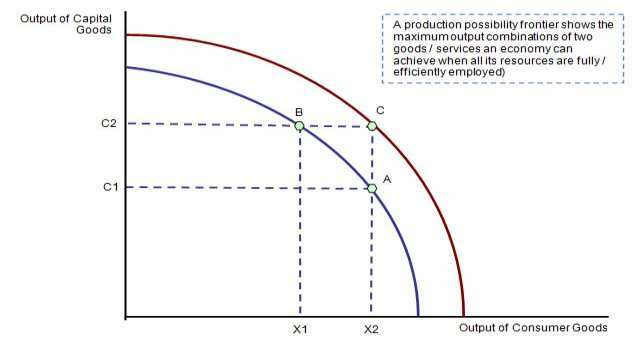 If aggregate demand increases faster than the increases in aggregate supply, then there will be an excess demand but a shortage in supply in the economy. Hence, producers will tend to increase the price and this situation is known as inflation (Beardshaw et al., 1998). When aggregate demand continues to increase but the economy is already at its full productive potential, over-heating will occurs (Anderton, 2008). This will then leads to high inflation with little or no increase in output. In 1980s, the inflation increased by 10% in the UK because of the high economic growth (UK Recession, 2014). High level of inflation will decreases people’s confidence and this will decreases the number of local and foreign investments. So, it is important for a country to have equilibrium in the aggregate demand and aggregate supply to prevent inflation. Economic growth will cause a lot of environmental problems. During economic growth, factories will operate for a longer time to increase the production output so this will lead to the increase in the emission of carbon which then causes the air pollution. Economic growth means that a large number of raw materials are needed to manufacture more goods and services and this can quicken the depletion of non-renewable resources (Sloman, 2001). In an economic growth country, large amount of waste will be generated because of the high consumption and many forests will be destroyed to build factories in order to increase output. This action has then destroyed the habitats for plants and animals and also causes climate change. Hence, economic growth which damages the environment will then decrease the rate of sustainable growth (Beardshaw et al., 1998). Overall, economic growth can be a good thing because it leads to low unemployment rate and reduce poverty. When a country experiences economic growth, the national income will increase and this will then increase investments in technology which can then solve the environmental problems and produce some alternative materials which to replace those non-renewable resources. Gross Domestic Product (GDP) is the total value of output produced in an economy over a period of time (King, 2012). GDP is also used to measure the national income which includes the value of indirect taxes such as VAT (Mankiw, 2013). GDP per capita is measured when GDP is divided by the number of people in the country. GDP can be expressed in two terms, real GDP and nominal GDP. Real GDP reflects the value which has been adjusted for inflation while nominal GDP reflects the value without considering inflation (Abel, Bernanke and McNabb, 1998). The following section will highlight how GDP is measured, the benefits and limitations of GDP per capita, other ways to measure the standard of living along with conclusion. The benefit of using GDP per capita to measure the standard of living is that it is used widely in the world so this allowed countries to make comparison (Burda and Wyplosz, 1997). By measuring the GDP, people will know how the economy works and this helps government, businesses and economists to predict and plan for the future (Mankiw, 2013). GDP per capita is a useful measurement because it shows the average output each person provides to the economy and it is measured frequently. Hence, this allows us to judge economies positions more accurately. So, when GDP per capita increases, this indicates that there has been economic growth and the standard of living had increased as the consumption rose. GDP per capita also has its limitations. GDP only measures the output in the legal economy but it does not take into account the black economy. Some people were tempted to work in the black economy because they wanted to avoid paying a huge amount of taxes (Barro, 1984). It is very difficult to measure the size of the hidden economy but in the UK it was estimated to be around 7-15% of the GDP (Anderton, 2008). The countries which have the highest percentages of black economy in the world are Thailand and Nigeria (Limitations of GDP When Measuring Living Standards, 2014). Besides this, GDP also ignores the environmental costs. If the GDP per capita is calculated by considering the environmental costs, then it would be much lower than the true value. Hence, a country with a high GDP per capita does not mean that the quality of life is high, possibly because of the inherent pollution. The United States, which has a high GDP per capita, was ranked as the 2nd most polluted country in the world (Top 10 World’s Air Polluted Countries, 2012). Besides GDP, there are still other ways to measure the standard of living, such as Human Development Index (HDI), Human Poverty Index (HPI) and Genuine Progress Indicator (GPI). HDI is used to measure the development of an economy based on three criteria, life expectancy at birth, education level and the standard of living which is measured by using real GDP per capita (Doyle, 2005). In the year 2010, the country which had the highest HDI was Norway and the country with the lowest HDI was Zimbabwe (Equality matters if we are to reduce poverty, 2010). Human Poverty Index (HPI) is a composite measure of long healthy life, knowledge and the ability to get the basic needs (Maunder et al., 1995). HPI is constructed for developing countries (HPI-1) and industrial countries (HPI-2) (Grant and Vidler, 2000). GPI is altered by the variables which related to the economy, society and the environment, such as income distribution, changes in leisure time, value of volunteering jobs and the cost of pollution (Genuine Progress Indicator, 2014). Abel.A, Bernanke.B. and McNabb.R. (1998) Macroeconomics, New York: Addison Wesley. Anderton.A. (2008) Economics, 5th edn. , Ormskirk: Pearson Education. Barro.R.J. (1984) Macroeconomics, 4th edn. , US: John Wiley & Sons. Beardshaw.J. , Brewster.D. , Cormack.P. and Ross.A, (1998) Economics, 4th edn. , England: Addison Wesley Longman Limited. Begg.D. , Fischer.S. and Dornbusch.R. (2003) Economics, 6th edn., England: McGraw-Hill Publishing Company. Blanchard.O. (2000) Macroeconomics, 2nd edn. , USA: Prentice-Hall. Burda and Wyplosz (1997) Macroeconomics, Oxford: Oxford University Press. Doyle.E. (2005) Economic System, England: John Wiley. Equality matters if we are to reduce poverty, (2010) Available at: http://www.theguardian.com/global-development/datablog/2010/nov/04/human-development-index-equality-matters (Accessed: 23 June 2014). Genuine Progress Indicator, (2014) Available at: http://genuineprogress.net/genuine-progress-indicator/ (Accessed: 23 June 2014). Grant.S. and Vidler.C. (2000) Economics in Content, Oxford: Heinemann . Gross fixed capital formation, (2014) Available at: http://data.worldbank.org/indicator/NE.GDI.FTOT.ZS (Accessed: 22 June 2014). Hall, S. (2014) How Does Investment Affect Productivity & Economic Growth?, Available at: http://www.ehow.com/info_10010620_investment-affect-productivity-economic-growth.html (Accessed: 22 June 2014). Kim.C. and Rector.R. (2006) Evidence Shows Reduced Dependence, Poverty, Available at: http://www.heritage.org/research/reports/2006/08/welfare-reform-turns-ten-evidence-shows-reduced-dependence-poverty (Accessed: 22 June 2014). King, D. (2012) Economics, United State: Oxford University Press. Limitations of GDP When Measuring Living Standards, (2014) Available at: http://www.tutor2u.net/economics/content/topics/livingstandards/limitations_of_gdp.htm (Accessed: 23 June 2014). Lipsey and Chrystal (2011) Economics, 12th edn. , Oxford: Oxford University Press. Mankiw.N.G. (2013) Macroeconomics, 8th edn. , US: Charles Linsmeier. Matthews.K. , Powell.M. and Parkin,P. (2012) Economics, 8th edn., England: Pearson Education Limited. Maunder.P. , Myers.D. , Wall.N. and Miller.R. (1995) Economics Explained, 3rd edn. , London: Collins. Parkin.M. (1997) Macroeconomics, 3rd edn. , USA: Addison-Wesley Publishing Company. Poverty, (2014) Available at: http://www.economicsonline.co.uk/Managing_the_economy/Poverty.html (Accessed: 23 June 2014). Samuelson.P. and Nordhaus.W. (2001) Economics, 17th edn. , New York: McGraw-Hill. Quorn investment creates 400 jobs in Teesside and North Yorkshire, (2014) Available at: http://www.bbc.co.uk/news/uk-england-tees-27137657 (Accessed: 19 July 2014). Riley.G. (2012) Economic Growth, Available at: http://tutor2u.net/economics/revision-notes/as-macro-economic-growth.html (Accessed: 19 July 2014). Riley.J. (2012) Economic Environment, Available at: http://www.tutor2u.net/business/strategy/economy-business-cycle.html (Accessed: 19 July 2014). Sheffrin.S. and Sullivan.A. (2006) Economics, 4th edn. , United State: Pearson Education. Sloman.J. (2001) Essentials of Economics, 2nd edn. , England: Pearson Education Limited. Soskice.D. and Carlin.W. (2006) Macroeconomics, New York: Oxford. Sutcliffe.M. and Sloman.J. (2001) Economics for Business, 2nd edn. , England: Pearson Education Limited. Taylor,M. And Mankiw,N. (2011) Economics, 2nd edn., United Kingdom: Linden Harris. Top 10 World’s Air Polluted Countries, (2012) Available at: http://the10mostknown.com/top-10-worlds-air-polluted-countries/ (Accessed: 23 June 2014). UK Recession, (2014) Available at: http://www.economicshelp.org/macroeconomics/economic-growth/uk-recession-1991/ (Accessed: 22 June 2014). Understanding GDP and how it is measured, (2013) Available at: http://www.ons.gov.uk/ons/rel/elmr/explaining-economic-statistics/understanding-gdp-and-how-it-is-measured/sty-understanding-gdp.html (Accessed: 23 June 2014). "Causes, Advantages and Disadvantages of Economic Growth." UKEssays.com. 11 2018. All Answers Ltd. 04 2019 <https://www.ukessays.com/essays/economics/causes-advantages-disadvantages-economic-8990.php?vref=1>. "Causes, Advantages and Disadvantages of Economic Growth." All Answers Ltd. ukessays.com, November 2018. Web. 20 April 2019. <https://www.ukessays.com/essays/economics/causes-advantages-disadvantages-economic-8990.php?vref=1>. UKEssays. November 2018. Causes, Advantages and Disadvantages of Economic Growth. [online]. Available from: https://www.ukessays.com/essays/economics/causes-advantages-disadvantages-economic-8990.php?vref=1 [Accessed 20 April 2019]. UKEssays. Causes, Advantages and Disadvantages of Economic Growth [Internet]. November 2018. [Accessed 20 April 2019]; Available from: https://www.ukessays.com/essays/economics/causes-advantages-disadvantages-economic-8990.php?vref=1.